Sew Mama Sew has posted a tutorial by the super clever Lorraine of Ikat Bag today—how to sew a little zippered wallet that unfolds into a bag. Like a transformer. It's an Autobag, or maybe a Recepticon. Thanks for featuring my fabrics, Lorraine! P.S. The Needle Shop, who manufactured my latest line, is now offering Outside Oslo fat quarter bundles. Get small pieces of all the prints as a set right here. P.P.S. Sorry to the nonsewers for all the fabric-centric posts lately. I'm always a little giddy after a new line comes out! Recepticon! I love it. I'm excited to make this bag. I always want to carry one in my purse but something very compact. This is perfect! Erica, I plan to do some non-sewing tutorials with this fabric, too. I'm sympathetic to your plight, since I'm not a huge sewer myself. I love that this came out now. My sis & I are planning the family Xmas & this will make a great prize & I have plenty of time to get the whole process down. No last minute finagling here! Funny post (Recepticon, I love it! lol). I'm just getting into sewing and your posts are inspiring me to really give it a shot! Thanks for the heads up, this is a killer project. I'm waiting on my yardage of your line!! Yes, Lorraine does superb work!! I must make this for all of the women in my family and freinds, it is just too cute to pass up. Great fabric choices too, LOVE! It's clever. I like it and love the fabrics. I'm going there right now! Ooh, great idea! That type of bag would make a great gift-wrapper as well! I wrote this on FB too. Love this. Like things that serve multiple purposes. I once bought a store made version of this,... and to my frustration, the bag would never go into the stupid wallet. I gave up on this things ever since. Untill today!!! I really hope it works, or I will be forced to take drastic mesures!!! Love the sewing posts. And FQ bundles. Dangerous! 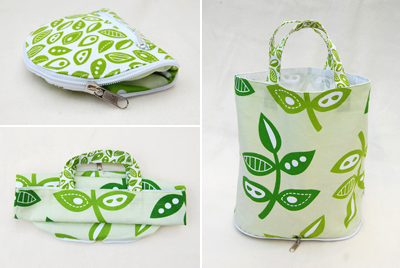 Thank you, Jess, for featuring my bags-featuring-your-fabric. What a brilliant word Recepticon is! You crack me up! Pow! I love your stuff! Alejandra, that collar is awesome! Makes me think I should get a dog. Love the photography, too. Well done. This is awesome! I would love to receive one of these as a gift! That is A-mazing! So pretty. Great job to your mum! I have featured it…along with some other gifts for teachers here…. ….if you would like to take a look. Thanks again for a super cute idea. Have a very old one kinda like this and am giddy to find this pattern to make a new one. Love to keep it in the glovebox so I have a bag ready at a times. Thank you so much for posting this! !